I stayed at the Princess Bavaro Platinum in room 761 from March 30 to April 6th. It was great. The room was excellent. Water pressure was awesome and by being platinum, my room was right across the street from the beach. The restaurants Chopin Sakura and Tenyaki were all excellent: One of them was buffet though which was also excellent: by being platinum I could reserve my restaurant seating ahead of time. Wonderful personnel and very clean grounds. Will return no doubts! Overall, very fun trip- loved Punta Cana! The beach was beautiful, drinks were great! The platinum lounge was underwhelming- would be much improved by better/more snack options (at least some nachos) rather than mostly just yogurt and apples, later hours, and a friendlier bartender. The platinum pool bar was great- shout out to Tony!! The shuttle was full a lot of the time by the time it wrapped around to the platinum section so we walked most places. The grounds and rooms are beautiful, but starting to look a bit outdated- areas could use some fresh paint or more upkeep. Italian restaurant was excellent, steak restaurant service was not good- took over 2 hours to get our food, hibachi was fun and good food, buffets were good. The casino is super sketchy- would not recommend wasting your time. Also drinks at the bar in the casino are NOT free. Some hotel staff were VERY friendly and outgoing, others were not accommodating at all. The setting was nice. I liked the ecological area. Communicating with staff was sometimes difficult. Too many tourists for me. It definitely had a tropical paradise feel to it. There wasn't enough activities for kids though. I would have given 5 stars if there were enough activities to keep the kids busy rather than just playing at the beach and pool. Nice hotel but the restraunts were sub par. The beach was very nice and the room was clean. Hotel close to the beach. Room phone has not been fixed for 7 days. Vendors on beach terrible- makes real staff look bad. Sand/beach platinum staff amazing. Easy to walk around, lots to do. Avoid the vendors for the private island tour. Go platinum for 5-8 days- relaxation fantastic. Spa worth it as well. Beautiful resort and love he beach! The staff are awesome and eager to make your stay memorable. The grounds were beautiful, the employees were very nice. The rooms, very clean and roomy. We were their celebrating our 8th year wedding anniversary and our cleaning lady always made up our room with very romantic decorations. I didn't care for the pushy sales people in the lobby or their sales tactics, but all in all it was a great vacation. Thank you, Bavaro Princess for making our 8th year wedding anniversary a memorable one. Bávaro Princess All Suites Resort Spa & Casino places you next to Cortecito Beach and within a few miles (5 km) of other popular attractions like Arena Gorda Beach. This 808-room, 4-star hotel has 3 outdoor pools along with private in-room spa tubs and 8 restaurants. Free buffet breakfast is included with your stay and awaits you each morning from 7 AM to 10 AM. Enjoy dining at Hispanola, one of 8 onsite restaurants. Order from 24-hour room service to satisfy your hunger without leaving your room. Guests can expect to find WiFi and 32-inch a plasma TV with cable channels. The bathroom offers a jetted tub, hair dryers, and free toiletries. Other standard amenities include private spa tub, free minibar items, and a balcony. 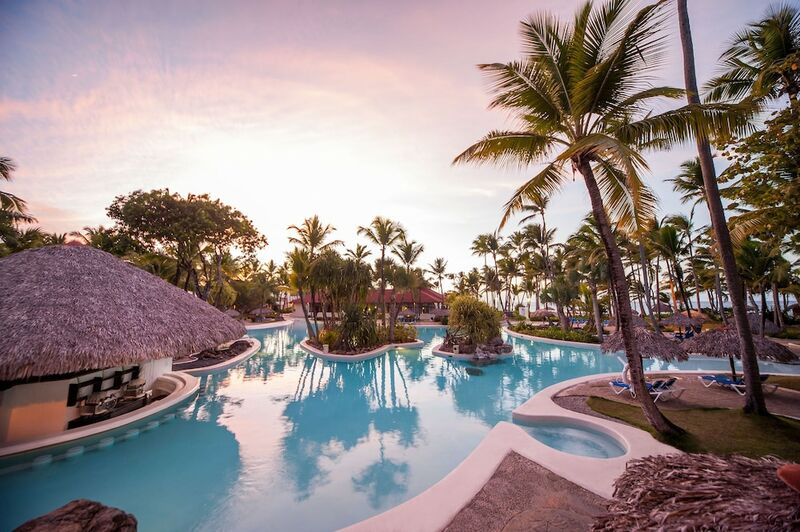 Bávaro Princess All Suites Resort Spa & Casino features a full-service spa, 3 outdoor pools, and a casino. You can take advantage of free parking, along with a free beach shuttle. The 24-hour front desk has multilingual staff ready to assist with dry cleaning/laundry, luggage storage, and concierge services. Other amenities at this beach hotel include a nightclub, a children's pool, and a health club. Dear Guest. Thank you for taking the time to share a post a review of your trip at our property. We are thankful that you choose our hotel as your holiday destination and for all the compliments regarding our hotel facilities. At the same time, we do apologize for any possible inconvenience you might have experienced while you were staying within us. We would love to have another opportunity to be your host again if you return to Dominican Republic. Best wishes, J. De La Vieja General Manager Bavaro Princess All Suites Resort, Spa and Casino. Dear Medo. Thank you for taking the time to share a post a review of your trip at our property. We are thankful that you choose our hotel as your holiday destination and for all the compliments regarding our hotel facilities. At the same time, we do apologize for any possible inconvenience you might have experienced while you were staying within us. We would love to have another opportunity to be your host again if you return to Dominican Republic. Best wishes, J. De La Vieja General Manager Bavaro Princess All Suites Resort, Spa and Casino. Dear Guest. Thank you for rating us. Best wishes, J. De La Vieja General Manager Bavaro Princess All Suites Resort, Spa and Casino. Dear Guest. Thank you for taking the time to share a post a review of your trip at Bavaro Princess. We are thankful that you choose our hotel as your holiday destination and for all the compliments regarding our hotel facilities. We would love to have another opportunity to be your host again if you return to Dominican Republic. Best wishes, J. De La Vieja General Manager Bavaro Princess All Suites Resort, Spa and Casino. Dear Guest. Thank you for taking the time to share a post a review of your trip at Bavaro Princess. We are thankful that you choose our hotel as your holiday destination and for all the compliments regarding our hotel facilities. At the same time, we do apologize for any possible inconvenience you might have experienced while you were staying within us. We would love to have another opportunity to be your host again if you return to Dominican Republic. Best wishes, J. De La Vieja General Manager Bavaro Princess All Suites Resort, Spa and Casino. Dear Guest. Thank you for sharing a review of your holidays at our hotel. We appreciate you for having chosen our hotel as your holiday destination as well as for the compliments regarding our hotel facilities. We hope to be your host on your next trip to the Caribbean. Cordial greetings, J. De La Vieja General Manager Bavaro Princess All Suites Resort, Spa and Casino. Hispanola - Restaurant serving breakfast, lunch, and dinner. El Pescador - Poolside restaurant and bar specializing in seafood. Open for dinner. Bella Pasta - Poolside theme restaurant and bar serving dinner. El Gaucho - Beachfront steakhouse and bar open for breakfast, lunch, and dinner. Tanuki - Garden-view restaurant specializing in sushi and serving dinner. Bávaro Princess All Suites Resort Spa & Casino features outdoor tennis courts and a health club. The hotel has 3 outdoor swimming pools and a children's pool. Other recreation options include a sauna. The nearest major airport is Punta Cana (PUJ-Punta Cana Intl. ): 26-min drive, 14.3 mi/23.1 km. To use the in-room WiFi (surcharge), guests must also rent an Internet router for a daily refundable deposit. Free WiFi is limited to the lobby area.